My sister wants me to make her something like this. I'm looking at a cheap little plate amp at Parts Express. It is a 2.1 amp, maybe a downward firing sub?? Drivers:there seem to be a lot to chose from. Kind of leaning to 6"ers. Maybe Silver Flutes? Does it need to go very loud? Party box? Nearfield? Fill a room background levels? Yes, that would be the amplifier. I don't think that it would need to go too loud, my sister lives in an apartment. So I will say it would be for background music that can grab your attention when needed. I think I can do it for $250 . She really could care less how well it sounds, but I have principals . Thanks Lin, I had been looking at the Tang Band's but hadn't noticed the Dayton. I will check me Email for the inevitable Parts Express flier with 20% off. Well, I have gotten myself into another project that may or may not work. We have to do stretches at work every morning (Because we are industrial athletes, lol) by the direction of a video. If you can imagine 25 tool makers and a half dozen engineers grunting and groaning in an fairly large space trying to hear the counting on the video coming through a sound bar on a monitor, you would soon figure out that we would need some sort of sound reinforcement. So a project was assigned to me to "up the volume" as cheaply as possible, using materials that we have available to us. 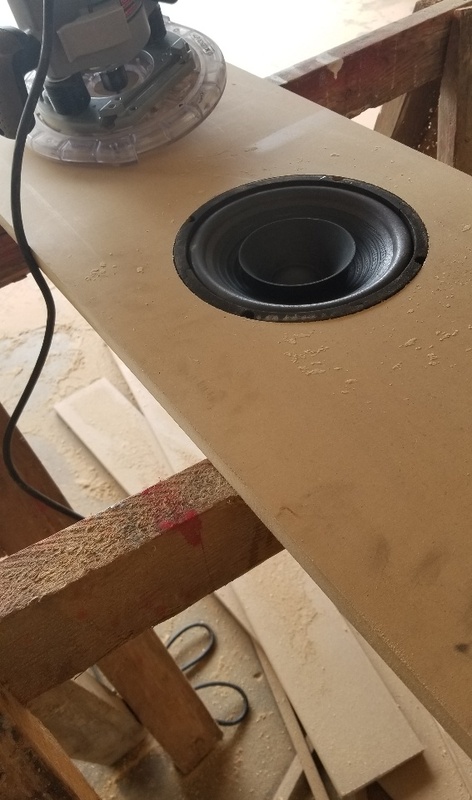 I came up with a plan of building a simple wedge shaped speaker box and using 2 GRS 8" Bofu full range drivers being driven by a cheap chip amp, all from Parts Express for around $60. 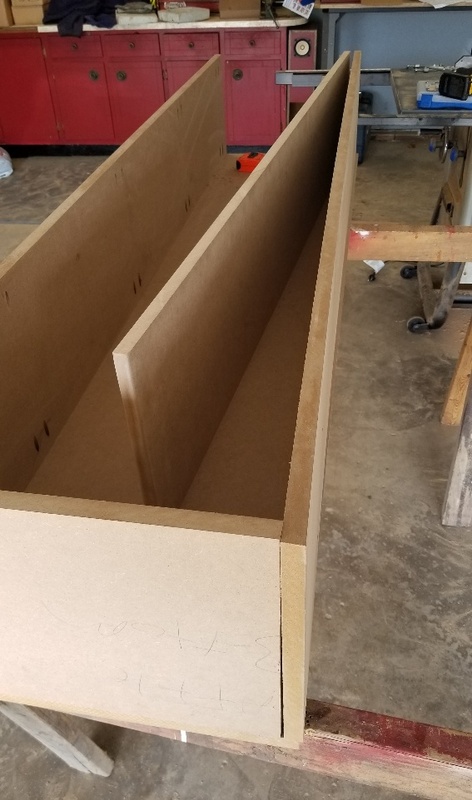 I had a extra sheet of MDF laying around my place that I would donate to the cause, and plans were made for a group project on a Saturday to knock it out. Well, this is where the project fell off of the tracks! A idea was brought up of cutting the MDF panels at work because we have some really nice machine tools at our disposal. Well all of a sudden it was brought up that an aluminum top on the speaker would look nice and by the end of discussion it had turned into making the whole damn thing out of aluminum! So currently we have a apprentice tool designer drawing up plans in Creo CAD, a sheet of scrap 10mm aluminum, a water jet, two apprentice tool makers, and myself working on this project. It will be a 4 cubic foot 60 degree triangle mounted to a 10 foot I beam when done. I really hope that it is louder than the sound bar! This project is gaining traction. The drivers and amplifier arrived this morning, the CAD files were finished and transferred to the water jet. The Apprentice that is in charge of this project promises me that I will be listening to the completed speaker tomorrow. 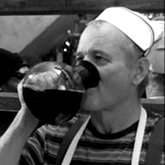 I figure that it will be closer to Friday, but I don't have his youthful exuberance. As a training tool, this project has been very useful. The Apprentices get a taste for putting in the needed work to detail something out. I gave them my basic idea for the speaker, they had to figure out how to manufacture it, how to assemble it, and how to finish it out. I don't think that we will be getting into the speaker business any time soon, seeing that we used $12 drivers and a $30 amplifier and put them into $1200 worth of aluminum with around $1500 of CAD time! I'll get some pictures as the cutting and assembly get rolling tomorrow. 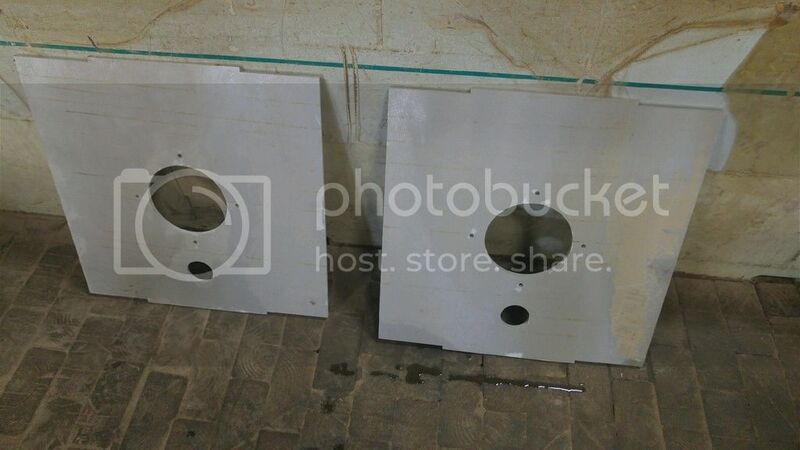 The baffles after they have been cut out. We got the speaker up and running today. It sounds remarkably good for a big aluminum wedge with a real cheap chip amp. The sound was echoing all over the shop, and it is a very large shop! We hope to get it mounted to the 10' pole Monday. The Apprentice did a more than passable job. 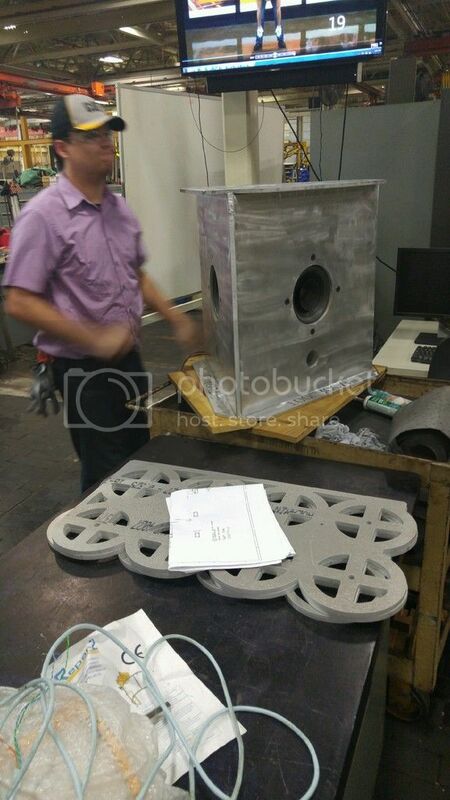 Wow, waterjet cut speaker box. That's pretty awesome! You know, it would be very easy get customer base with products like those! 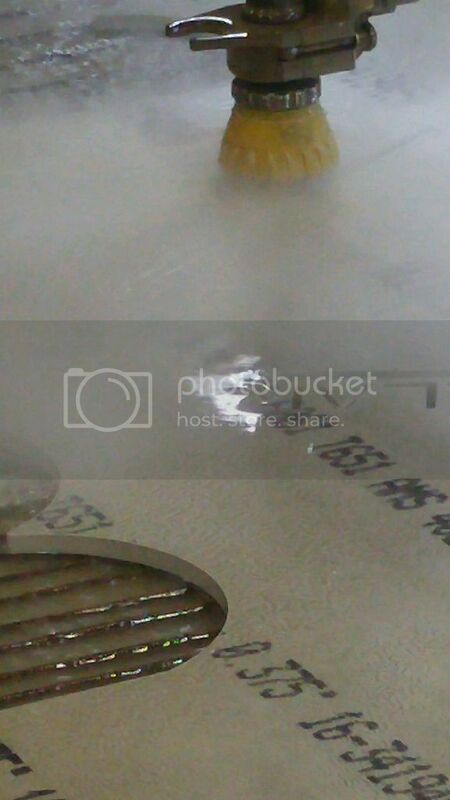 Water jetting is endless for ability to manufacture. still makes my head spin. 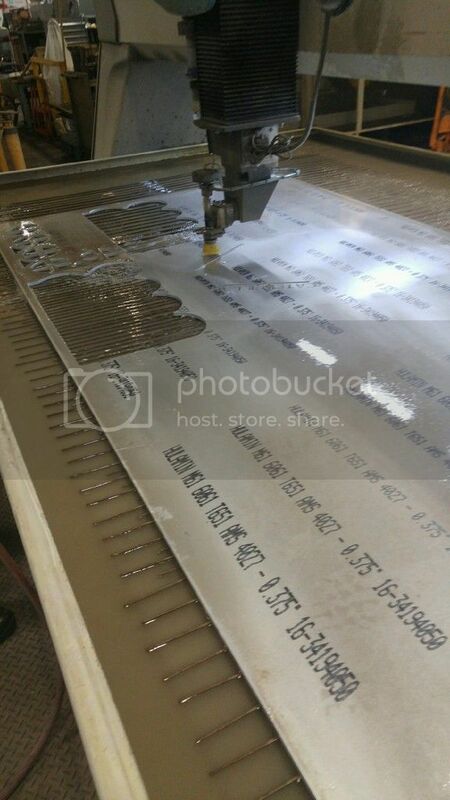 Waterjet isn't a big deal. Ours are just XY coordinates with the Z only used for thickness adjustment. Some of the 5 axis are trick, but still limited. Now the real trick stuff is 3D printing. If you can draw it, we can make it. I was just given a demonstration of 3D printing cores and flasks for castings. It makes the patternmaker in me very scared. No need for draft, impossible shapes can now be cast. Real cool tech. Cutting the speakers out of aluminum didn't really take too long, maybe 2 hours. The cost of the material is outrageous, somewhere between $1200-$1400 per sheet. But it was laying there from a project that had been killed. The best thing about the whole project is that other sections of the building are complaining that our "Tower O' Power" is blasting louder than their PA systems! The building is huge, a little over 1.5 million sqft! We make our presence known! There are currently 5 engineers designing new speaker designs in my cubical. It is a slow day at work. The current design is a open baffle/ downward firing sub hybrid. They are also talking Omni's. I wonder if Corporate would approve. My Sonotube speaker building projects are gaining traction. Calculations have been made on a transmission line subwoofer using a 10" Dayton driver. It looks like a 10" tube should be 89.13" long to achieve 37.7hz. Nothing like a 7.5' tall sub. I'm planning to use this in my garage stereo. Most likely building a pair because it would annoy the neighbor more! I am pondering on how to power these things. Do I use a cheap crossover and connect them to my Wadia DAC amp, or do I go with some sort of outboard amp with an adjustable crossover? If this idea lives to fruition the next project would be using larger diameter Sonotube to make a full range speaker using the drivers from my DM clones. My CAD Monkey drew up a horn idea inside of a 24" tube. Real interesting but somewhat difficult to make the shape of the baffle. No hill for a climber. 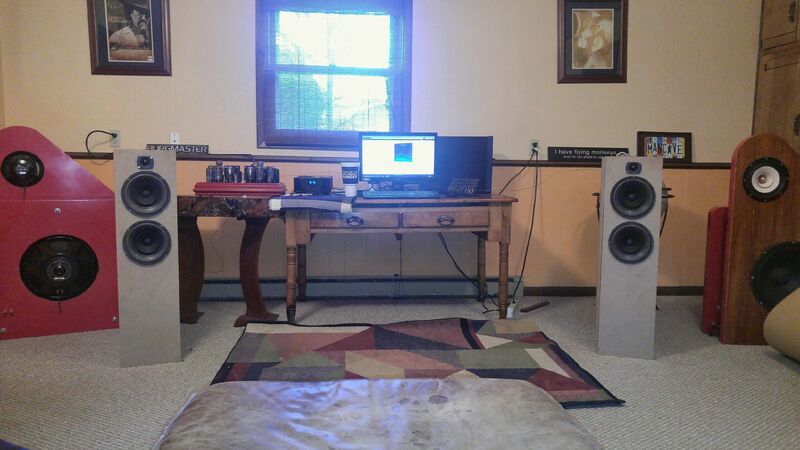 Well I settled on 12" Goldwood woofers and some Dayton 100 watt plate amps. A quick trip to Menards tonight yielded a couple of 4' long 12" diameter Sonotubes. I then just taped them together and stuck a woofer inside. Things got interesting after that. With no stuffing or even sealing the bass is very noticeable, even moreso outside. There is still a lot of development work to do, a proper box built and then build the twin to this one. Wow, that is quite a sono-sub! Did you calculate the airspace at all? Wouldn't a single 4' tube have been enough? Oh wait, you did say this was a Transmission line of some sort? So it's wide open on the bottom (non-speaker) end? 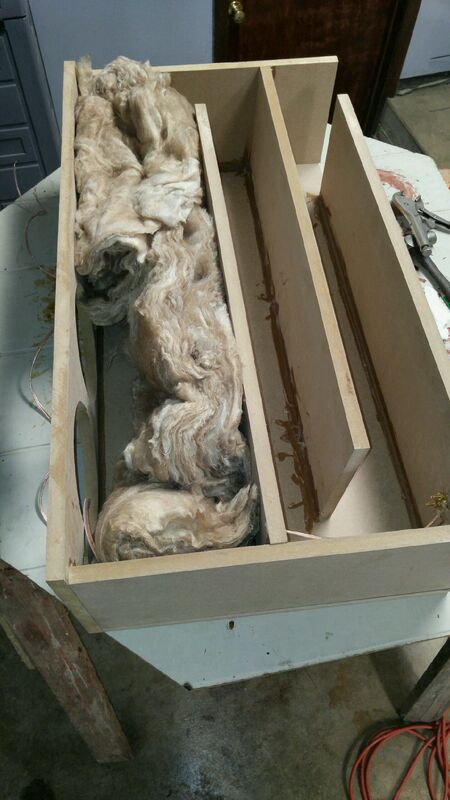 It is a quarter wave transmission line subwoofer. So yes it is more or less open, the driver on the bottom. I stuffed it 2/3 of the way up with fiberglass and it helped it a lot. The plan now is to make a box on the bottom to face the woofer out and help seal the whole thing up better. The combined length of the line needs to be 93 inches. I don't foresee any lacking of bass with two of them. Well, I "finished" my subs last weekend. Sorry that I took so long reporting back, I had a bad cold and some kind of heart thingy that required a bit of hospital time this week. Anyway, I decided to go the whole on "Hillbilly" method on these subs. All that it took was 4 ea. 12" store brand Sono tubes, a roll of red duct tape, some zip ties, 2 ea. Goldwood 12" woofers, and 2 ea. Dayton 100 watt sub amps. All I did then was cut a 45 degree angle a couple of feet in on what would be the bottom tube, rotate it 180 degrees to get my 90 and start taping them back together. Simple, effective, cheap, and ugly. 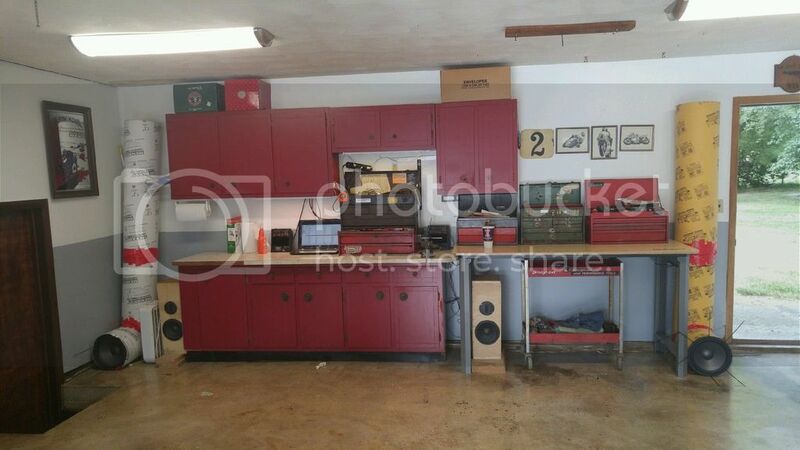 But so what, it is for my garage. So far, with very limited listening time, I am very happy with what I have wrought. Some time needs to be spent working with stuffing it. The whole garage stereo pulled 104 DB with the door closed, it should make the neighbors real happy. By the way, if you have chest pain that knocks you down a couple times a day for 3 weeks, the Doctors get real mad at you for not coming to see them sooner! Those remind me of something I once saw in a Cheech and Chong movie I do believe. Well Core, you have just named my subs. They will now be forever known as the Cheech & Chong memorial quarter wave subs. Got a kick out of these. Same idea as my bucket bass project. Just stuff that I had laying around, and a real deal on an 18" woofer. BTW, I hope that heart stuff works out good for you. There are too few of us staying young these days. 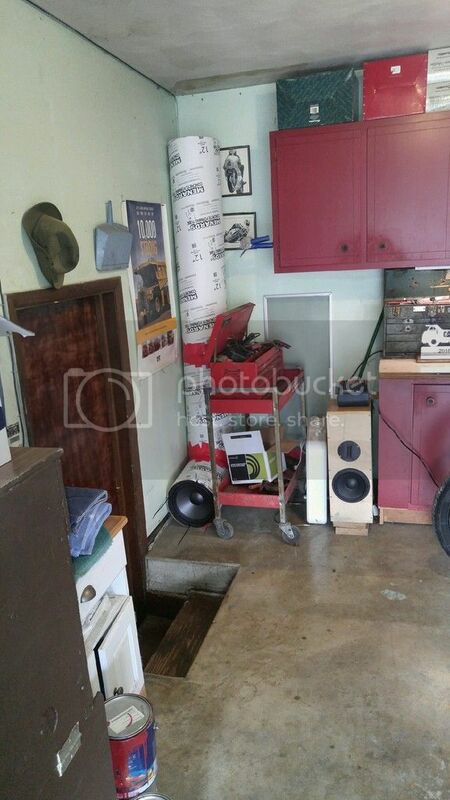 So I spent the whole afternoon today cleaning and organizing my garage, and playing my "Cheech & Chong Memorial " quarter wave subs. I'm pretty sure that everyone in earshot is hating me now. It seems that the bass notes are a lot louder outside than inside the garage. I guess that it is like the cars that go thumpety thump as they drive down the mean streets of Decatur! Anyway, it really does play loud and clear. It is time for me to make something different now, I'm open to suggestions. A photo of the end product. Dam good job cleaning out the garage! That was the project, right? Speaker projects are endless and a rest is ok for now, however.... Try something out of your regular stuff. No not explosives, but something in audio. I did. Cool thing is, you learn from the new experience. My new thing for now is headphones, and I had no idea how much they have improved. Well, you know me. I'd vote you make some diffusers. 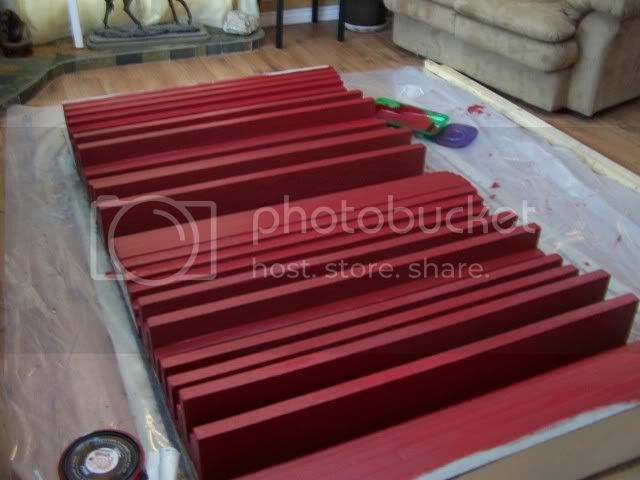 If you can cut some foam insulation, and maybe cut some 1/8" MDF - I can design it for you...you just need to make the mess of making big panels into little panels, then gluing them together into pretty patterns. I'm pretty sure I could even design something that's just foam insulation. Anyone can cut that without special power tools or hot wire...assuming your careful (unlike my recent incident). From several perspectives, that is just stunning! Probably the coolest looking small room I've seen... possibly ever. Great job. I have a pile of Lepai LP2020TI amps laying on my desk right now. I have not a clue of what I am going to use them for. Because of shipping charges it was within a couple of bucks to buy 2 instead of one, so what the heck? Has anyone ever messed with these things, maybe hot rodded one? I need someone to take my access to Parts Express away. 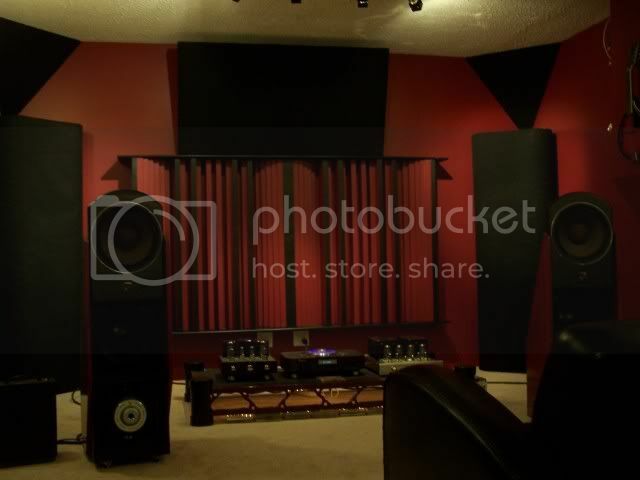 I just ordered up more speaker drivers, tweeters, binding posts and capacitors for yet another speaker project. I'm going to do a strange variation of a Nelson Pass design for the insanely cheap GRS Bofu drivers. It is a transmission line floorstander that looks fun to build. I'm going to really mess with the design by using 2 of the 8" Bofu's and a Peerless tweeter per speaker. The weird idea that I have is pointing one of the 8"s upward and the other one "normal" Why? Why not? I'll make the top replaceable so if it doesn't work I can go back to "stock". 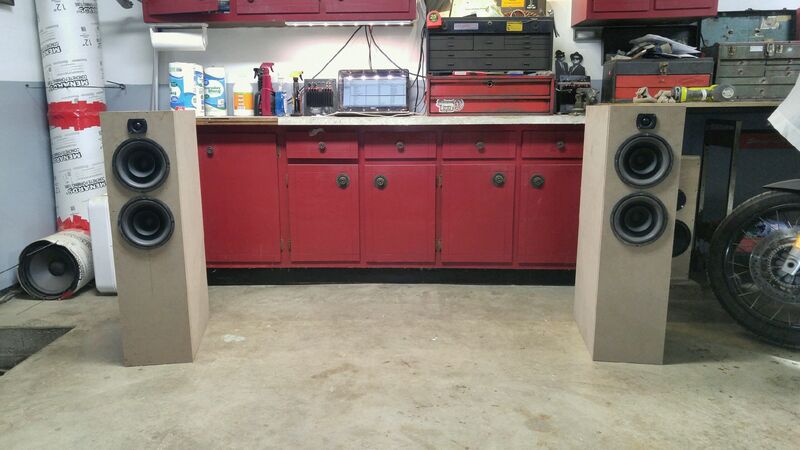 I got busy the last few days and built a pair of Pass transmission line speakers. I broke down and bought some tools to help speed things up, a Kreg Accu-Cut and a nice new Bosh circular saw. My quality definitely took a big jump forward. I modified the design by using two drivers in each speaker and adding a tweeter. So far I'm pretty happy, it is looking like I over stuffed them but that is a easy fix. Right now they are a little bass shy, but some break in and playing with stuffing will see if they wake up. If so then I will doll them up and give them to someone. I need to find someplace new to host pictures so I can show them off. OK, I'm trying Imgur. Sorry about the sizing! 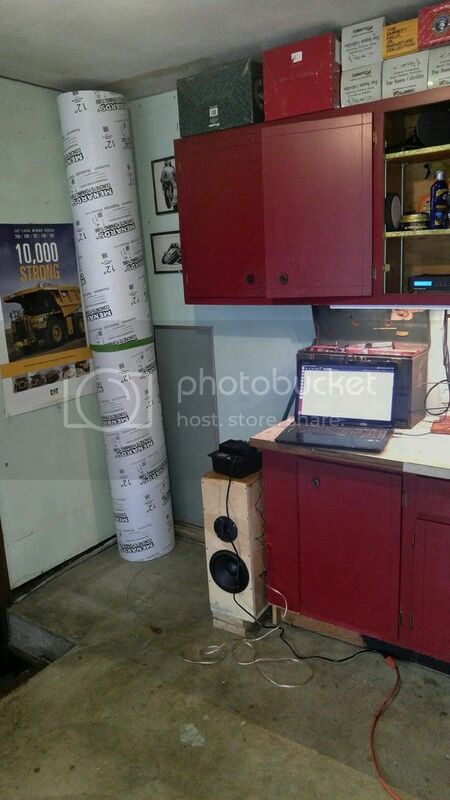 These are pictures of my Pass Bofu T-Line speakers that I modified by using 2 8" GRS drivers and a Peerless tweeter with a cap on it. The Bofu's run without any crossover. They sound pretty good in my room, not too bad for $12 drivers. I still have to finish them, I'm thinking veneer on the front and satin black for the rest. If anything they kept me off of the streets for a couple of days. BTW, I screwed up something the other day and have been locked out of the forum from my home. At work seems OK. Weird. And one in my listening room. I started a experiment today. The new transmission line speakers seemed to have a bit of bass weight to them. So I moved them over a hair, slipped my OB's back into their place, brought my sub plate amps in from the garage and hooked them up to the box speakers. So now the T-Lines are crossed over at around 80Hz and adding some bump to my open baffles. They sound OK, but have planted a seed of inspiration for another project. Things are getting stupid around here. 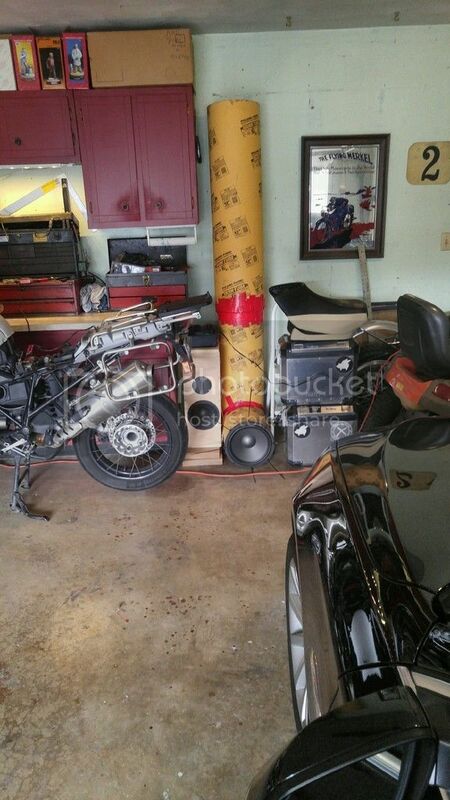 I've stacked my garage rocker speakers on top of my transmission line speakers. I'm running some sub plate amps on the transmission lines to give me thump. 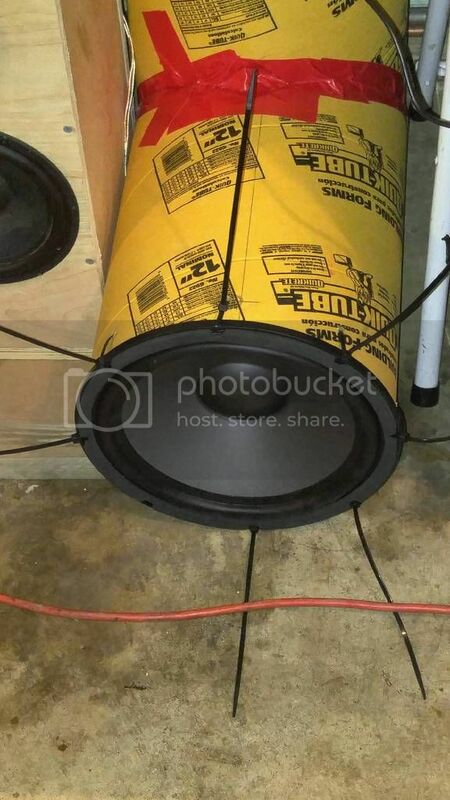 My nephew just bought plans for a 12” Deathbox sub. Guess what I’m making today? I’ll be annoying my neighbors while building something for my nephew to use to annoy his. The circle of life goes round and round. Nice! The Deathbox is fun! I had Steve's original one, made with marine grade particle board, and one of his 10" hand built drivers...hell, I had it for about 16 years I think, used in home theater and mostly on my computer as a small subwoofer setup. I sold it last year I think to a guy who read about Decware, and was blown away that I had this sub that he just happened to read about. Too bad he never posted in the forums though! Looking forward to pictures of your project! A fine pair of Dayton 8" PS220 point source drivers found their way to me this week (Thanks Dan) and I need to use them in something special. 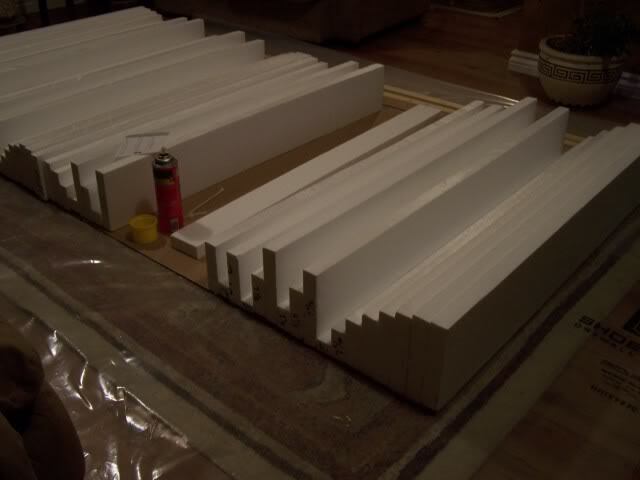 Well tonight 3 4'X8' sheets of 3/4" MDF were cut down to manageable sizes for my next project. 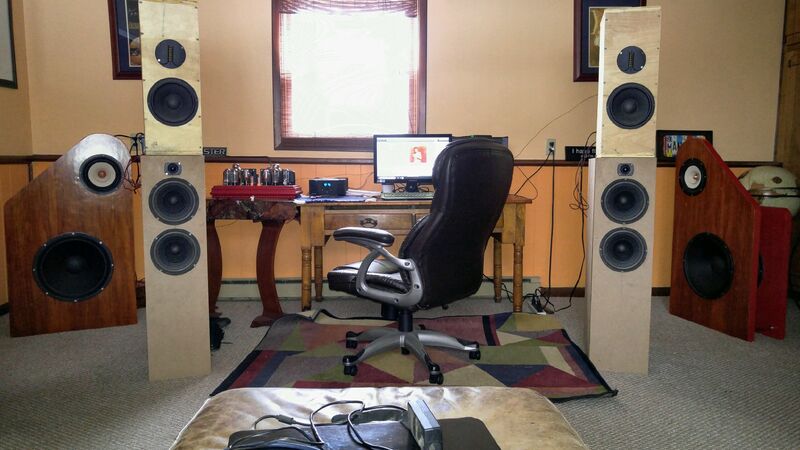 A very large pair of Bigger is Better speakers. They are going to be 6'4" tall! I'm trying out all of my new tools, hope that I can figure out how to operate them without cutting off any more of my fingers. Life is difficult enough with only 9. It is so much better building things with the right tool for the job. Below is a test cut of my hole cutting jig for my router. And another of when I was laying out the pieces. Nothing bolted together yet. I'm trying pocket screws on this build. Looking good, having the correct tools makes a world of difference when trying to build something. I made a pair of these a long time ago for the Fostex FE127 drivers. Have fun building them.